The Center on Budget and Policy Priorities finds that young adults have been hit the hardest by the recession and its aftermath. According to the Congressional Budget Office’s (CBO) recent budget and economic update, the percentage of people over age 16 who are working or actively seeking work has slipped fairly steadily for the past few years. 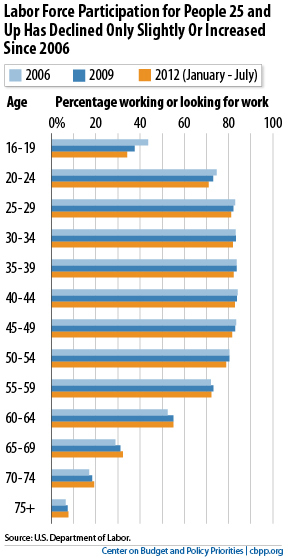 The recession and lack of job opportunities have left many young people (ages 16-19) disconnected from the labor force.